As many of my friends know, I’m pretty frugal. I will admit that I am 95% value driven in 90% of my purchases. This is why it is a big surprise that I bought something I thought I’d never buy… a NEW car. We needed to get a car to replace my tired old Mustang, and something that would be good for our upcoming family-to-be. So began the search for the best car value. Basically I used the prices of four comparable cars and weighed them against the features that were included at that price. After hours of calculations, I determined what car would provide me (and this is a very personal calculation) with the most “utility” or personal satisfaction per dollar spent. The first thing I did in my spreadsheet was to determine which features were important to me on a scale of 1 – 10. For example, alloy wheels aren’t as important to me as air conditioning, so alloy gets a 2 while A/C gets a 7. The next step was to list if the feature comes standard, is an option, or cannot be added at all. I gave a numeric value to these variables and multiplied it by my personal utility. Finally I took all these calculations and calculated how much satisfaction each dollar I spent gave me with each car in my list. The results… the Hyundai Elantra Gt! This spreadsheet is an example of my Excel addition. I love Excel, numbers, value, economics, and a nice new car. This spreadsheet pulls all of these things together. Keep in mind this spreadsheet and the calculations therein are NOT perfect. Looking over it now (three years later) I realize there are a few corrections that I need to make prior to my next vehicle purchase. Love this spreadsheet / point system. 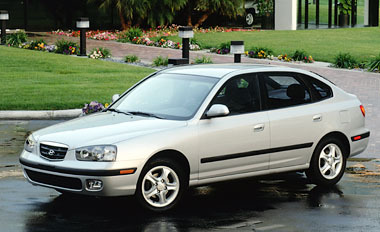 I did something similar in ’02 and settled on the Mazda Protoge’ 5, but the Hyundai Elantra GT was on my list. I think it came in 3rd or so. I had some soft categories like interior and exterior aesthetics. UPDATE: I’ve had my Elantra for about 13 years now. I only have about 80k miles on it, and most of those were from a SUPER long commute I had for 2 years. The other 11 years I just didn’t drive a ton (took BART or worked from home). I’m debating if I keep this one, maybe new paint job, etc. or start shopping for a new car.